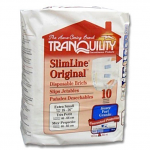 Tranquility is known for high quality disposable adult briefs that provide maximum absorbency. Sportaid is happy to bring you these Tranquility SlimLine Disposable Briefs to let you experience the joys of daily life with less stress. Disposable Briefs with Kufguards provide discreet comfortable protection that is secure, and they are worn like normal underwear. These Tranquility Disposable Briefs improve your lifestyle and enhance confidence and peace of mind, all while protecting your skin. When you save 38% on Tranquility Disposable Briefs, it makes Sportaid the right place! Whether you are a new customer or someone who has been with us for a while, we guarantee satisfaction. We have been making Tranquility Disposable Briefs affordable for over 25 years, and we continue to lead the industry! We carry a large selection of wheelchair cushions, wheelchair parts, and wheelchair accessories. We are capable of beating any competitor's advertised price, just call! Our customer service staff has over 50 years of experience, plus over 90 years of combined wheelchair use experience. We look forward to working with you!